Efforts to protect tropical forests in Southeast Asia for the carbon they store may fail because protection payments are too low – according to University of East Anglia research. A study published today in Nature Communications finds that schemes designed to protect tropical forests from clearance based on the carbon they store do not pay enough to compete financially with potential profits from rubber plantations. Without increased financial compensation for forest carbon credits, cutting forests down will remain more attractive than protecting them. Carbon credits are currently priced at $5-$13 per tonne of CO2 on carbon markets. But this doesn’t match the real break-even cost of safeguarding tropical forests from conversion to rubber in Southeast Asia – between $30-$51 per tonne of CO2. The research was led by the University of East Anglia, in collaboration with scientists from the universities of Copenhagen, Exeter, Oxford and Sheffield, and the Wildlife Conservation Society. 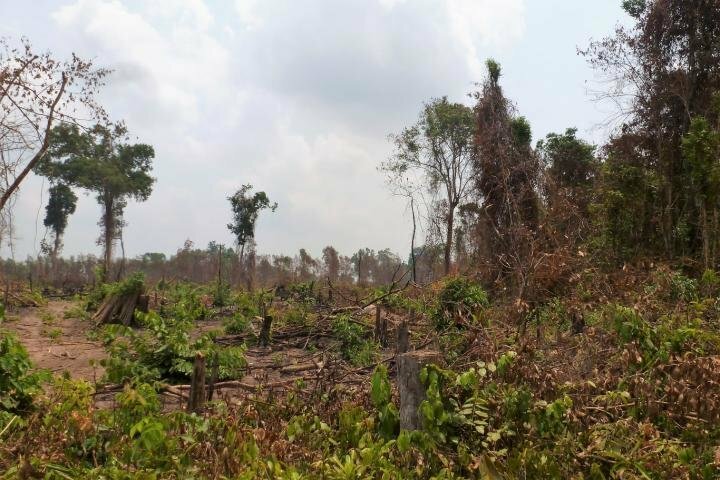 Lead researcher Eleanor Warren-Thomas, from UEA’s School of Environmental Sciences, now working at the University of York, said: “Forests are being converted into rubber plantations in Southeast Asia – especially in Cambodia, China, Laos, Myanmar and Vietnam. “Rubber production covers a massive area – 8.6 million hectares – which equates to around two thirds of the land used for oil palm plantations. 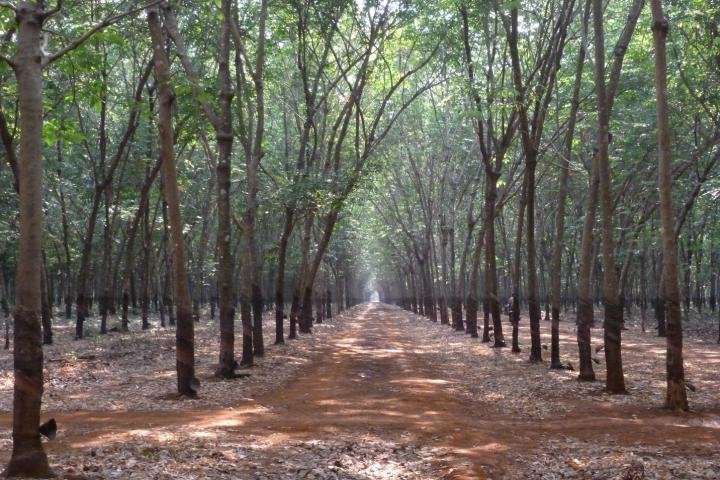 “Some of this area is traditional rubber agroforestry, but recent expansion has been of intensive monocultures. Demand for natural rubber, driven by the tyre industry, has driven this expansion. The consequences for biodiversity and climate change are very similar to that of oil palm. But rubber has not faced the same level of public scrutiny. “It’s a big problem because these forests are irreplaceable. They are globally unique ecosystems, supporting many threatened animals, birds and plants, as well as exceptionally valuable luxury timbers such as rosewood. Forests which are kept intact absorb and store carbon – this process can be translated into ‘carbon credits’ which can be offered to individuals, organisations, or even countries, to offset their own carbon emissions, or in wider efforts to combat global climate change. The service forests provide by absorbing and storing carbon is so important that financial incentives to reduce deforestation and forest degradation (termed ‘REDD+’) were included in the Paris Agreement at the COP21 international climate negotiations in 2015. The research team focused on Cambodian forests, where trees grow as high as 55 meters, and investigated whether carbon credits are enough to safeguard the forests by working out the amount of carbon held by the trees, and the amount of profit which could be made by logging and conversion to rubber. Eleanor Warren-Thomas said: “We collaborated with the Wildlife Conservation Society and the Forestry Administration of Cambodia, who have been working to establish a forest carbon project in Cambodia, and researchers from the universities of Copenhagen, Exeter and Oxford. They contributed their detailed and hard-won field measurements of forests to make this research happen. “This allowed us to make detailed and careful measures of both the carbon and the timber value of these forests.”The team went on to calculate how much each tonne of CO2 should be priced at to match foregone profits from timber and rubber profits – the ‘break-even’ carbon prices. The break-even price needed to offset all the profits from logging and conversion to rubber plantations, is much higher ($30-$51 per tCO2) than the prices currently paid on carbon markets ($5-$13 per tCO2), but is similar to or lower than the social cost of carbon (at least $36 per tCO2). This social cost is the estimated economic damage caused by an emitted tonne of CO2. Eleanor Warren-Thomas said: “It makes sense on a global scale to protect these forests and reduce CO2 emissions, rather than let the emissions happen and do economic damage. But, we show that current carbon prices need to be higher to incentivise forest protection. “Forest carbon credits place an economic value on the carbon storage ecosystem service provided by forests – we know that there are many other reasons why a forest might be conserved, aside from just the financial incentives offered by carbon finance, but carbon schemes are considered a useful tool in the battle against climate change and deforestation. “Forests are less likely to be protected using carbon finance if the payments coming in are much lower than the profits the forest would generate if cut down. We show that where demand for land for rubber plantations is driving deforestation, carbon payments are unlikely to appear an attractive alternative. “We also show that if you take away the threat of rubber, the profits from logging on its own seem to be sufficiently low for carbon finance to be a competitive alternative. That said, we may have undervalued some of the timber in our study, because the trade of rare but very high-value species, such as rosewood, is illegal and we know little about how much money is being made.